DE-Tenants.org has been following the money behind Douglas Emmett Inc.’s recent $2 billion buying spree in the Los Angeles commercial real estate market—an acquisition boom backed by the sovereign wealth fund of Qatar (the Qatar Investment Authority, or “QIA”). 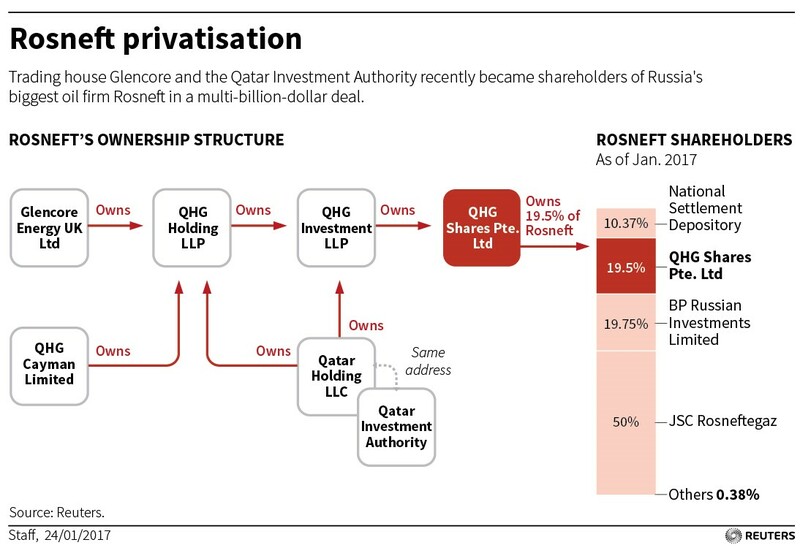 This post is looking into a separate QIA deal (unrelated to Douglas Emmett), focusing on the Qatari investment into the Russian oil giant Rosneft. Our previous posts on the Russia deal (see Part 1 and Part 2) looked into the bank financing for the QIA-Glencore joint venture acquisition of a 19.5% stake in Rosneft. Today’s post explores the role of offshore firms in the deal’s structuring. Like many large deals, the Rosneft privatization used a structure of shell companies owning shell companies, commonly referred to in Russia as a “matryoshka,” after the wooden nesting dolls that open to reveal a smaller doll inside. Singapore-based QHG Shares is owned by QHG Investments, a U.K.-registered limited liability partnership incorporated on 5 December 2016—four months after QHG Shares but just in time for the Rosneft acquisition. QHG Investments was originally controlled by two Glencore entities, but they were replaced by two other owners/members days before Banca Intesa Sanpaolo issued a EUR 5.2 billion loan. The two owners were Qatar Holding LLC (QIA’s primary investment vehicle) and QHG Holding LLP another U.K. limited liability partnership. Records from the U.K. Companies House show that QHG Holding is in turn owned and controlled by three corporate members: Glencore Energy UK Ltd, Qatar Holding LLC, and QHG Cayman Ltd. The latter is a company registered in the corporate services office of the offshore law firm Walkers in the Cayman Islands. QHG Cayman Ltd was appointed as a designated member of the limited partnership on 16 December, nine days after Rosneft announced the deal and 11 days after QHG Holding was formed. Reuters provided the helpful graphic below. The use of an offshore company is not an indication of wrongdoing, but it can make it next to impossible to determine the true owner of an asset from public records. Unlike the information available in the corporate registry of the U.K., details about the beneficial owners of Cayman Islands entities, like QHG Cayman Ltd., are not publicly available. It is the presence of the opaque QHG Cayman Ltd that has led reporters at Reuters to raise questions about potential shadow buyers involved in the deal who may account for the missing 22% of the capital stock and therefore may represent a sizable chunk of the 19.5% Rosneft stake. Since the conclusion of the 19.5% sale, the CEOs of QIA, Glencore, and Banca Intesa Sanpaolo have met Vladimir Putin and Igor Sechin at the Kremlin. Per a Rosneft press release, they are considering new joint projects in the liquefied natural gas (LNG) sector. Qatar is the world’s largest exporter of LNG. And for their part in the Rosneft deal, Mr. Putin awarded one of Russia’s top honors for foreigners—the Order of Friendship—to Sheikh Abdullah, Ivan Glasenberg and Carlo Messina. 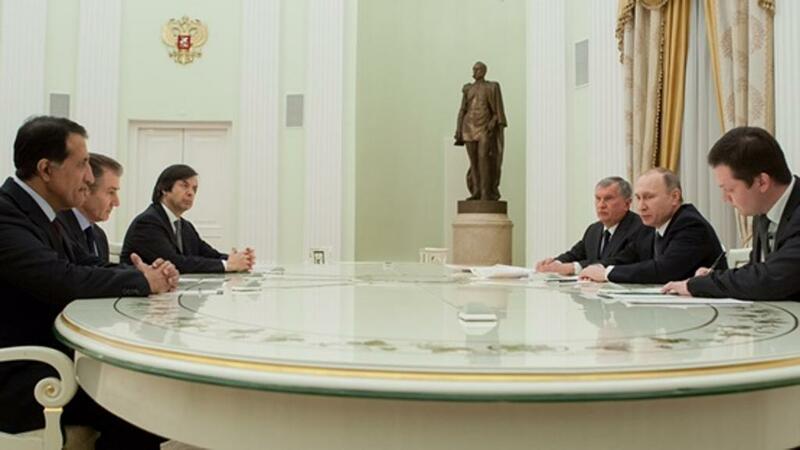 From left to right: CEO of the Qatar Investment Authority (QIA) Sheikh Abdullah bin Mohammed bin Saud Al Thani, CEO of Glencore PLC Ivan Glasenberg, and CEO of Banca Intesa Sanpaolo Carlo Messina meet with Rosneft CEO Igor Sechin, Russian President Vladimir Putin, and an unknown man in the Kremlin on 25 January 2017 following the purchase of 19.5% of Russian state-owned Rosneft. Despite the convoluted chain of corporate shell companies that ultimately led to an opaque tax haven, U.K. records did provide further details regarding the financing arrangement with Banca Intesa Sanpaolo. The parties’ charge documents (i.e. mortgages) submitted to the U.K. corporate regulator exclude the key documents including the “Intercreditor Agreement” and, more importantly, the “Senior Facility Agreement” for Banca Intesa Sanpaolo’s EUR5.2 billion loan to the QHG firms. This makes it difficult to scrutinize the terms of the deal. However, the charge documents reference an “Intra-Group Loan Agreement” between QHG entities. Parties included in the agreement were Qatar Holding, QHG Holding, QHG Investment, QHG Shares and another firm called QHG Trading LLP which we have not mentioned yet. An excerpt from a charge document is below. QHG Trading LLP is yet another U.K. firm. It was incorporated on 5 December 2016, the same day as QHG Holding and QHG Investment. The firm is controlled by two members, a Glencore subsidiary and Qatar Holding LLC. QHG Trading’s involvement in the Rosneft deal is not entirely clear. Reuters and oil trade publications revealed that Rosneft and QHG Trading had made an offtake deal. Per the terms, Rosneft agreed to supply QHG Trading up to 55 million tons of crude oil in total over a 5-year period according to a formula pegged to global oil prices. Presumably the oil was intended for resale at a profit because Glencore had crafted a similar agreement with Rosneft as part of the 19.5% stock sale. Missing documents such as the Intra-Group Loan Agreement could shed light on the matter. Beyond the involvement of QHG Trading, a charge document submitted by QHG Holding reveals that the CEO of QIA personally signed as an “authorized signatory,” thereby indicating the CEO’s personal knowledge of and possibly participation in the deal. 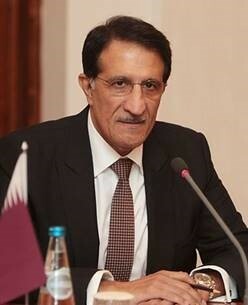 The CEO is Sheikh Abdullah bin Mohammed bin Saud Al Thani, a member of the Qatari royal family. An excerpt from the charge document is featured below. 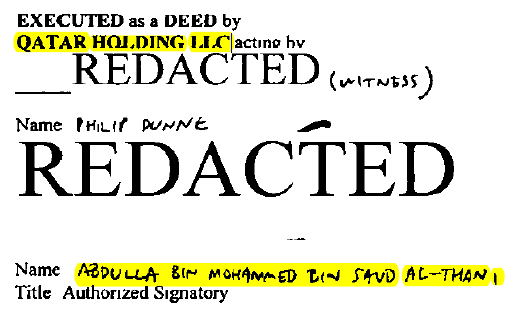 While Sheikh Abdullah’s signature is redacted, like all signatures in U.K. charge documents, the authorized signatory is identified as Sheikh Abdullah, signing on behalf of Qatar Holding LLC.